'...The figures at the Cross were symbols of all who crucify. We were there in our representatives. What we are doing now to the Mystical Christ, they were doing in our names to the historical Christ. If we are envious of the good, we were there in the Scribes and Pharisees. If we are fearful of losing some temporal advantage by embracing Divine Truth and Love, we were there in Pilate. If we trust in material forces and seek to conquer through the world instead of through the spirit, we were there in Herod. And so the story goes on for the typical sins of the world. They all blind us to the fact that He is God. There was therefore a kind of inevitability about the Crucifixion. Men who were free to sin were also free to crucify. As long as there is sin in the world the Crucifixion is a reality. As the poet has put it: "I saw the son of man go by, Crowned with a crown of thorns. 'Was it not finished Lord,' said I, 'And all the anguish borne?' "He turned on me His awful eyes; 'Hast Thou not understood? So every soul is a Calvary And every sin a rood.'" We were there then during that Crucifixion. The drama was already completed as far as the vision of Christ was concerned, but it had not yet been unfolded to all men and all places and all times. If a motion picture reel, for example, were conscious of itself, it would know the drama from beginning to end, but the spectators in the theater would not know it until they had seen it unrolled upon the screen. In like manner, our Lord on the Cross saw His eternal mind, the whole drama of history, the story of each individual soul, and how later on it would react to His Crucifixion; but though He saw all, we could not know how we would react to the Cross until we were unrolled upon the screen of time. We were not conscious of being present there on Calvary that day, but He was conscious of our presence. Today we know the role we played in the theater of Calvary, by the way we live and act now in the theater of the twentieth century. That is why Calvary is actual; why the Cross is the Crisis; why in a certain sense the scars are still open; why Pain still stands deified, and why blood like falling stars is still dropping upon our souls. There is no escaping the Cross not even by denying it as the Pharisees did; not even by selling Christ as Judas did; not even by crucifying Him as the executioners did. We all see it, either to embrace it in salvation, or to fly from it into misery. But how is it made visible? Where shall we find Calvary perpetuated? Okay, I admit. I am posting the eloquence of Venerable Fulton Sheen because it explains quite clearly why Mass is not a 'social event' with a forceful clarity greater than Pope Francis (and most Catholics indeed) can manage. That's why this heroic Archbishop is a Venerable. As Pope Francis says, Mass is not a "social event". But why is this so? It is surely because we are present not at a "memory" fashioned in the minds of Christians, even if we are present at a 'memorial'. We are present at the re-presentation of Christ's Sacrifice of Calvary. I am led to believe by the teaching of Holy Mother Church that we are indeed present at Calvary - indeed we are 'out of time and space' - at every Holy Sacrifice of the Mass. I am led to believe that while it is vital that we 'remember' with solemnity the Passion and Death of Our Blessed Lord when at Mass, especially in the moments leading up to the Consecration, that we are also to be mindful that we are there. Of course, it may be that this is sort of what His Holiness Pope Francis is saying or the kind of thing that he might say in future. I do so wish His Holiness would say it clearly. We always need reminding! That we are at the Events of Redemption is, in my opinion, more important that our memory of it - just as our personal faith in the Real Presence (which may be strong or may be feeble) is of lesser importance than the truth that He is truly Present and relies not on our personal faith to be in the Blessed Host in order to be present under the guise of bread and wine. The holy doctrine that we are at Calvary at Mass is, in my honest opinion, more important even than our personal 'remembering' of the events which wrought our redemption. I am of the opinion - and I am not alone in it that it is the loss of this vital element of devotion in the Holy Sacrifice of the Mass - this important truth of the Most Holy Faith, which we are as Catholics in conscience all bound to accept - that has led so many to believe we are only at a 'celebratory' meal with Jesus. I think this is what the Holy Father is trying to say, but, when speaking of such holy and sacred things, it is easy for us all to allow our words to fail to do justice to the sublime Sacrifice of Love on Calvary which is re-presented (rather than 'represented') at each and every Mass. I recall talking to one of the Norbertines when I visited. He maintained that every crisis in the Church has been a crisis of faith in the Real Presence. I'm just a lay man, but such a crisis of faith persists in the Church today on a global scale. If one thing has been undermined among the many truths of the Faith it is this truth. It is surely a crisis that could amply be addressed by His Holiness Pope Francis, a Pontiff able to communicate simple truths of Faith both effectively and to a wide audience. 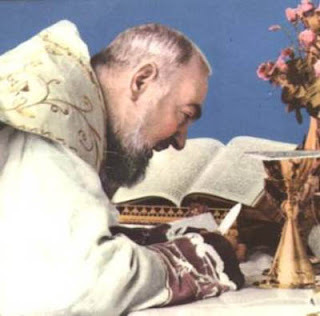 When St Pio of Pietrelcina would say Mass (which, I believe he always did Ad Orientem), he would weep tears as he got to the holy words of Consecration. That's not because he was thinking, 'This is going to be such an amazing meal'. I don't think he was just remembering the Lord's Sacrifice either, solemn as his remembrance would have been. I think he knew he was there, 'right there, right now' offering that very Sacrifice. Merely 'remembering' Christ's Sacrifice and believing that the Mass is only a memorial of that Sacrifice is what Protestants believe. The Saints have shown us time and time again that we are not only remembering the Events of our redemption, but that at Mass we are there at those Events. Thank you for this lovely article. I'm bookmarking it to use in preparation for a class on the Eucharist that I'll be teaching to 10 year olds. Most of them think that Holy Communion is a meal - and they received First Communion only two years ago! Thank you, this was beautiful. Whoa hold up... what is Bp Sheen doing in Eastern Vestments!? I like what you are saying but have gotten distracted by the picture. would it be possible that you add the gadget "archive" to your blog? It would be much easier to find some of your older articles. 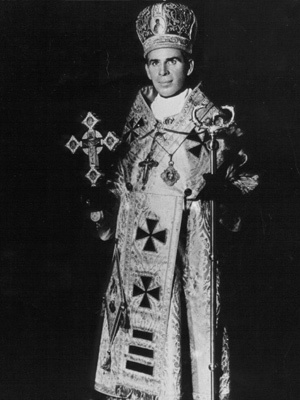 I remember reading an article in an American Altar severs magazine in the early 60s about Bishop Fulton Sheen celebrating the Divine liturgy according to the Byzantine Rite Melkite Use in English in New York.Of course Mass was then said in Latin in the Extraordinary Form so the reporter was astounded to be able to worship and understand the prayers and upon recieving Holy Communion to hear the Bishop use his name.The article had many photos of The Liturgy and I developed a lifelong interest in The Catholic Eastern Rites and Churches.